Please take time to read these terms and conditions governing the Sian Ka´an Village website. By accessing this website, you agree to accept, without limitation or criterion, all of these terms and conditions of use. The disclaimer does not apply for groups or weddings. Room rates shown on the Sian Ka´an Village website are charged on a per room per night basis. Special Internet rates are only valid when booking through www.SianKaanVillage.com. All rates quoted in US dollars will be converted into local currency (MXP) upon settlement. All rates include Tourism Levy and/or any other applicable government taxes. Bookings may be made online at www.SianKaanVillage.com, through our call center or calling us directly at 1 855 355 1067 (US/CAN). Reservations are required prior to arrival. Reservations are only valid with a Guarantee Deposit. Reservation inquiries are not confirmed automatically and will be replied to within 2 working days. Late check-outs on or after 6:00 p.m. incur a $70.00 USD per person surcharge in All-Inclusive plans. Late check-outs on or after 6:00 p.m. incur a $70.00 USD per room surcharge in Room-Only plans. You will be charged for the 50% in guaranteed after making your reservation. The remaining balance will be charged 1 month before the arrival. Guarantee deposit must be made through the next 24-hours after your reservation has been completed. Deposit should be transferred to Sian Ka´an Village with copy of payment document to be emailed. Package and Special reservations are subject to a fifty percent guarantee deposit with the remaining balance due at check-in. Guarantee Deposits can also be completed providing your Charge Authorization Letter including your credit card data and ID. A credit/debit card is required at the time of booking. All payments should be directed to Sian Ka´an Village. If providing credit card details, we will confidentially use the information for further processing. A Guarantee Deposit (including room rate, tax, service, meals and any extra services requested) will be required upon reservation confirmation. Confirmation of changed reservation is subject to room availability. Sian Ka´an Village reserves the right to debit your credit card with a cancellation fee equal to a set number of reserved nights. High Season 14 days prior are subject to a cancellation fee equivalent to two nights of accommodation. Peak Season 45 days prior are subject to a cancellation fee to the full length of stay/total number of room nights reserved. There will be a full charge for no shows and cancellations made on the date of arrival. Full charge will be applied for shortened stay. Above cancellation policy is not valid for non-refundable special promotions. Children age is under 12 years old. All-inclusive plans are subject to a $50.00 USD surcharge per night per extra child. 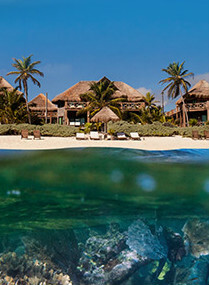 All-Inclusive plans are subject to a $105.00 USD surcharge per night per extra adult. Some of the Hotel facilities are free of charge while other incur a surcharge. Please confirm or contact us to avoid misconceptions. The Hotel is not and shall not be liable for any loss or damage to property owned by, or in the custody of the Client or its guests, employees, agents or contractors, or the external suppliers. Safe deposit boxes may be provided by the Hotel for the Clients use at the sole risk of the Client. Some of our rooms are suitable for guests with disabilities. Suitable rooms are listed at each hotel. These rooms have been independently inspected. If you or any member of your party require special facilities please advise us when you request a booking. With the exception of assistance dogs, no pets are allowed. Pillows, bed sheets, duvets or other items of bedding. Any electrical appliances and/or equipment for heating and/or cooking purposes. Sian Ka´an Village reserves the right to remove and/or confiscate any of the above items found in any room immediately without notice to you and to charge you for any costs incurred for taking such action. You are expected to conduct yourself at all times in an orderly and acceptable manner and not to disrupt the quiet enjoyment of other guests. We reserve the right to immediately terminate your booking and the booking of any members of your party if we (acting reasonably) deem your conduct to be in breach of this clause. These Terms and Conditions shall be governed by and construed in accordance with the laws of Mexico.